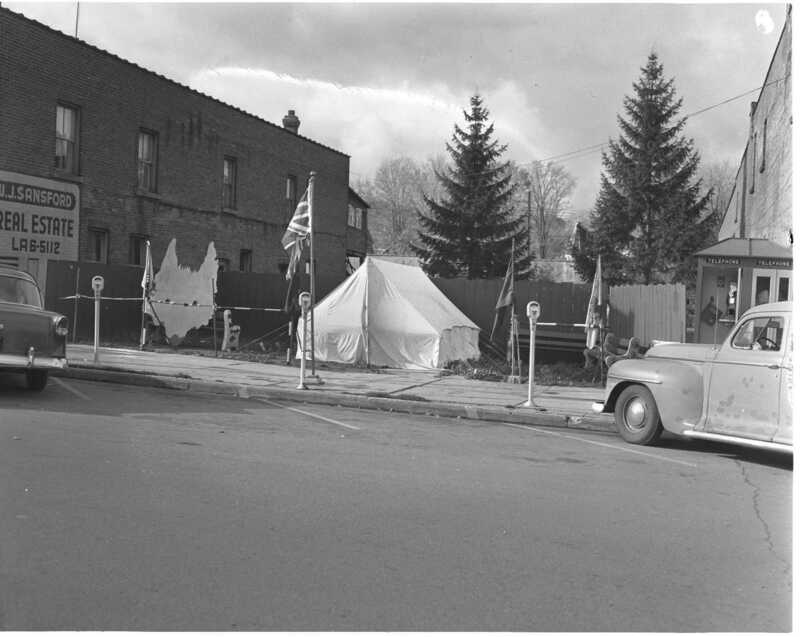 Last week we posted the photo that matches the caption below, here is another view from the same day without the boys but showing a broader view of the vacant lot that is now occupied by the Arcade Jory drug store. There were public washrooms on this site. “Apple Day” this year for Boy Scouts and Wolf Cubs of South Georgian Bay District netted the association more than $600.00. Starting out from their tent pitched on King Street are Midland Scouts, Paul Delaney, Ken Cleary, Andy Desroches and Frans Kes. Guest speaker at a joint banquet held at Coldwater United Church last week by North Simcoe branches of the Women’s Institute was Mrs. Wanda Miller, mayor of Gravenhurst and a W.I. past president. 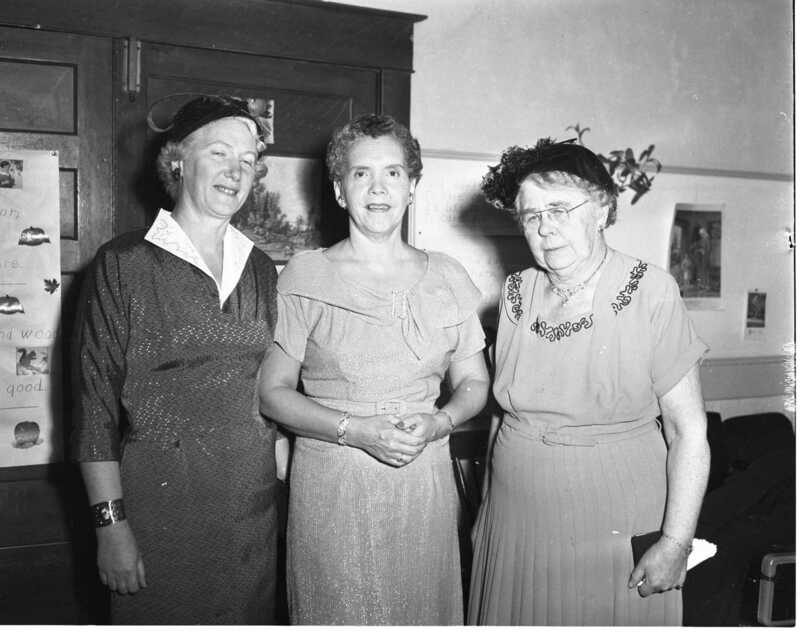 With her are Mrs. Lloyd Dunlop, left, and Mrs. Blanche Durnford of North River. Mrs. Durnford who was district president in 1938 has been a member of the North River branch since World War 1 days. 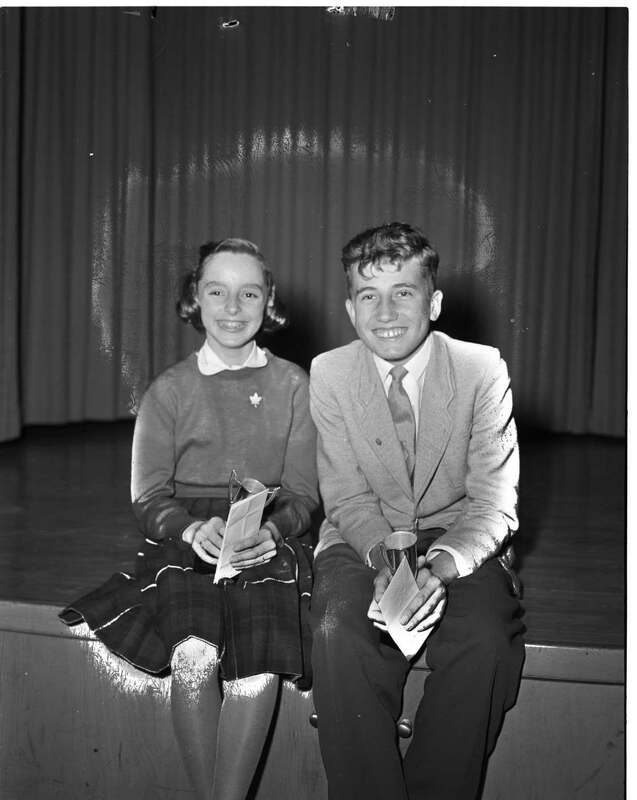 Winners of the public speaking contest for Midland elementary schools Friday night were Marie McLaughlin of Sacred Heart School and Dietmar Wagner of Regent School. 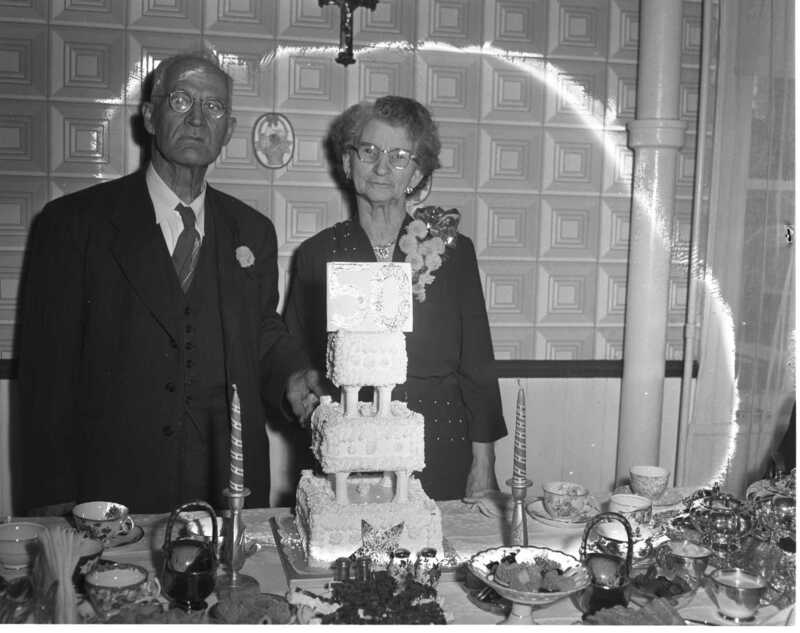 Mr. & Mrs. Henry Gamelin of Victoria Harbour are shown as they cut the cake at their golden wedding anniversary celebration in their home Saturday. Starting as a trimmer at ten years of age, Henry worked for Waldie Lumber Company for 45 years and when it closed he worked for McGibbon’s in Penetang for 13 years. Not the goose that laid the golden egg but she does lay double yoked eggs. 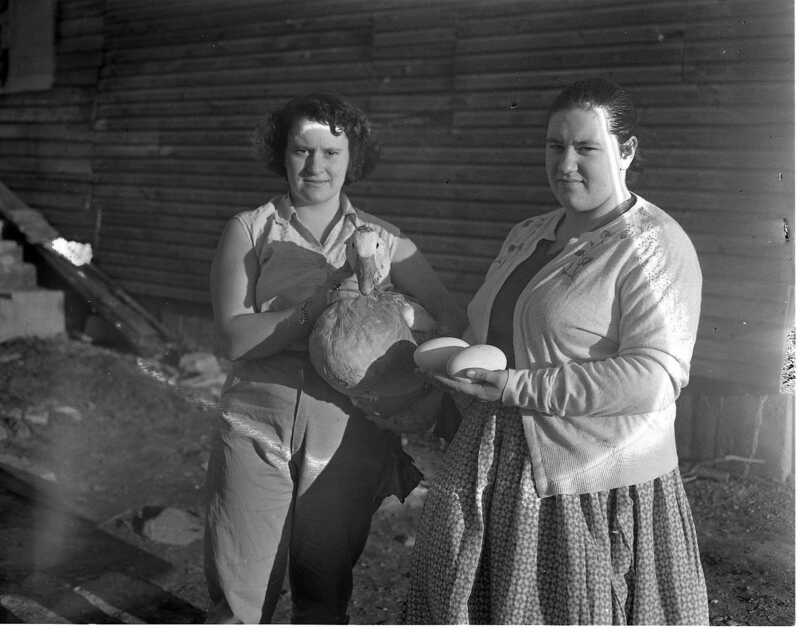 Edna Marchant holds the goose that laid the eggs held by her sister Mary. The girls and the goose live a farm on Concession 3 Tay, near the Old Fort school. 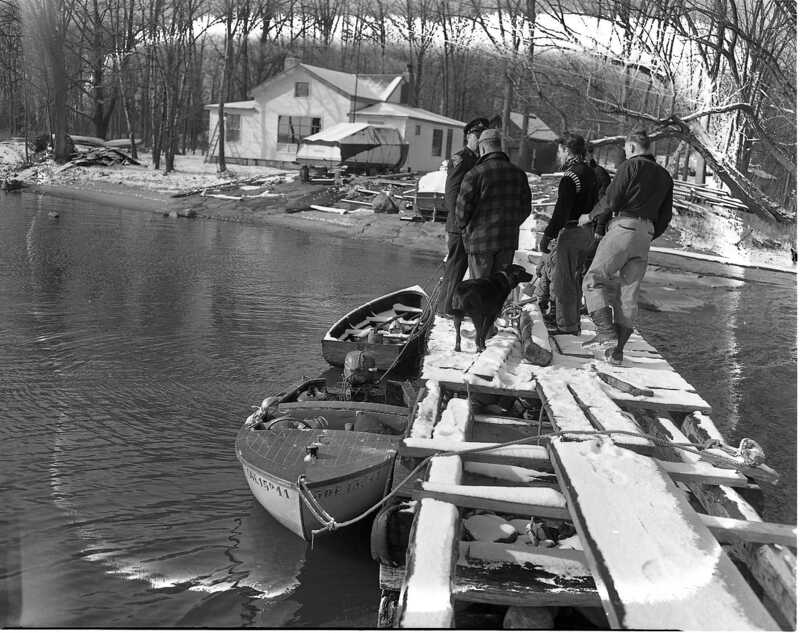 These men saw the partially submerged boat of the four deceased Toronto duck hunters floating by this cottage owned by W. E. Russell, on the left. They all assisted in the search. Donald Curl, Ian Miller and Ken Thistle all of Toronto and Barry Petman, of MacDiarmid, Ont. Chuck Stelter of Midland caught this twenty-six inch, seven pounds, eleven ounce Rainbow Trout in the Sturgeon River on November 3rd. 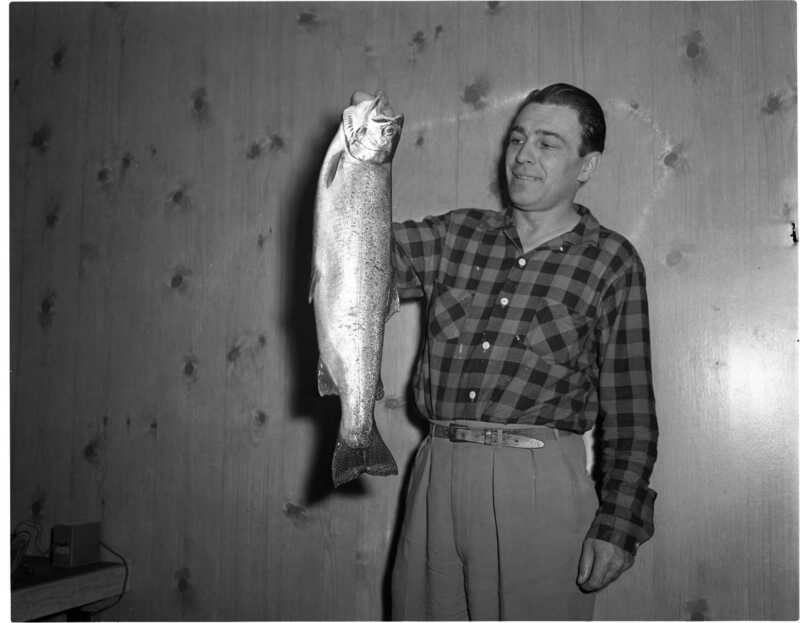 It was caught just below the Black Watch Camp using six-pound test line and a Mepps spinner. It took Chuck about twenty minutes to land this beauty. A yearling steer owned by Grant Fagan was shot and butchered by thieves in the night. The animal was the 4H project of Lorraine Fagan. Another animal was wounded but has been treated and will survive. 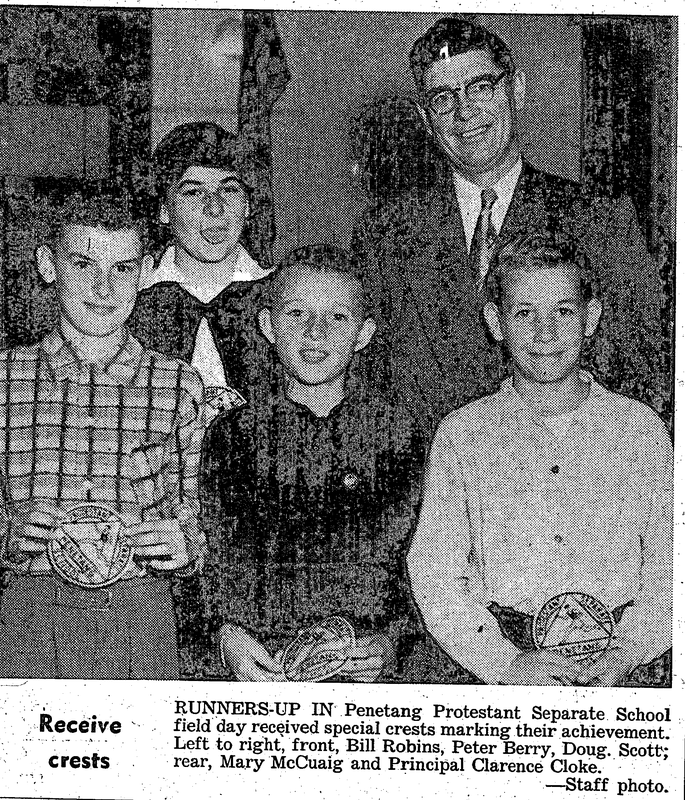 The County Herald headline from November 8, 1957. “Rustlers Invade Tay Farm, Shoot Girl’s Prize Steer” Grant Fagan and Mrs. Fagan were sitting in their farm home at Lot 85, Con. 2 when they heard blasts from a shotgun shortly after midnight Monday. They did not go outside to investigate the shots at the time. 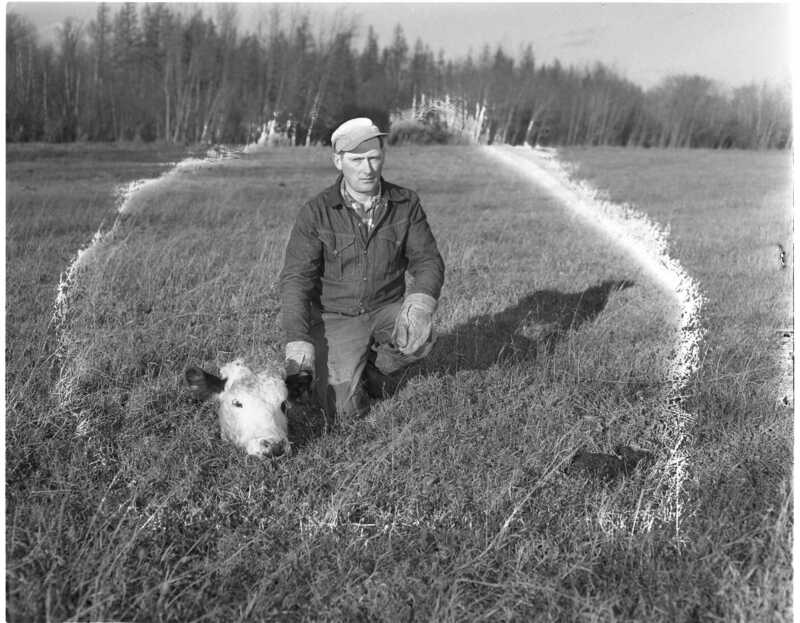 Late Tuesday afternoon a neighbour told Mr. Fagan he had seen the remains of a young steer which had apparently been killed and butchered in a field bordering Con. 1 sideroad, about a half mile from the farm house. Further investigation disclosed that another beast, a valuable purebred Aberdeen-Angus yearling, had been hit in the right side of the jaw and throat by shotgun pellets. Elmvale veterinarian John Windrum was called and Mr. Fagan said Wednesday there is hope the black heifer may be saved. The dead steer, which would have been a year old in December had been purchased by the Fagan’s’ 14-year-old daughter, Lorraine, a member of the Ebenezer 4-H Club. 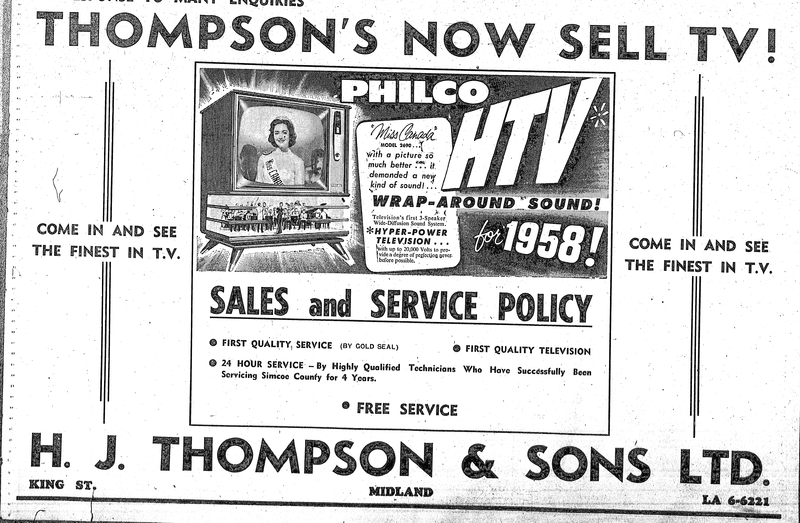 The County Herald headline from November 11, 1957. “Urge Park Development for 12 Mile Bay Project” If comments made at the November meeting Monday night are any indication, Midland council favours the establishment of a provincial public park on Crown land in the 12-mile Bay area, west of the Trans-Canada Highway. 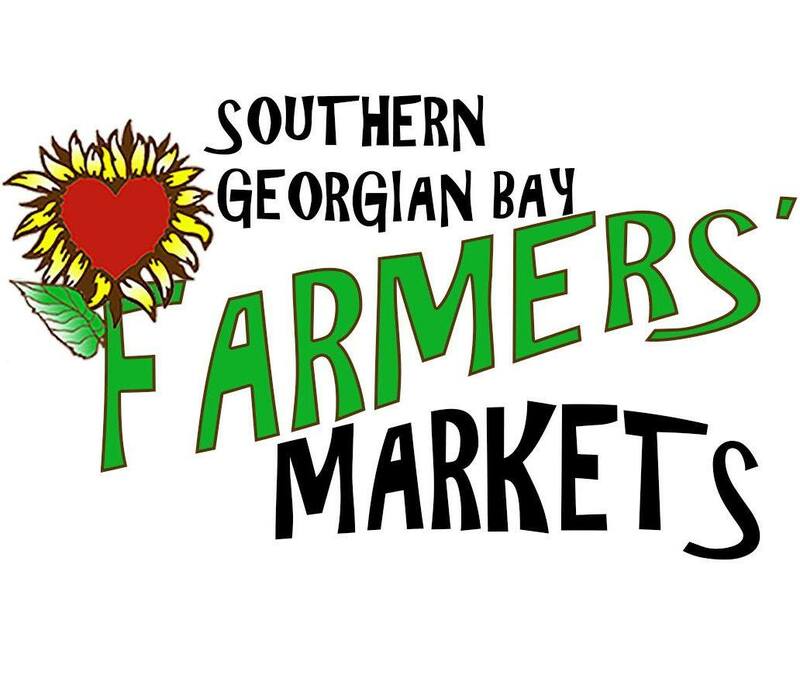 The comments were made during à discussion of a brief submitted by C. C. Jeffery of Midland on a proposed development road which would run from the Trans-Canada into 12-Mile Bay. The consensus of the council was that if the 12-Mile Bay area was opened up for cottage development as now proposed, it would be detrimental to the tourist industry in Midland and lower Georgian Bay area. The Free Press Herald headline from November 13, 1957. “Reverse Previous Stand, Two-Year Term Vote Off” In a complete reversal of its stand taken at the October meeting, Midland council voted 4-2 Monday night to quash a move to place before electors in December the question of a two-year term for future councils. The vote was the outcome of a lengthy discussion of the underlying principle of the issue. During the debate, several councillors admitted they had had second thoughts on the proposal following the last meeting. In the recorded vote on the motion quashing the referendum in December, Alderman Clinton Smith and William Orr, Reeve W. H. Keller and Deputy-reeve R. J. Pinchin voted in favour, Aldermen Douglas Haig and Herb Beauchamp voted against the motion. Following on the heels of a joint meeting of YMCA directors and Midland police commission Oct. 29, Midland ‘Y’ officials have implemented a six-point program to regulate dances, operated by Hi-Y Clubs under ‘Y’ sponsorship. Dance chaperones will be increased from two to four; doors will be closed at 10.30 p.m. and no new persons admitted; new dance membership cards have been issued; all boys must wear dress strides, and girls slacks or skirts (those in jeans and dungarees not admitted); all topcoats and other outdoor apparel must be left on the main floor and not taken to the dance floor; dances will be open to boys and girls of high school age only. Announcements: Mr. and Mrs. David J. Miller of RR 3, Barrie, announce the engagement of their daughter, Elsie Noreen, to Mr. Laurence N. Wood, son of Mr. and Mrs. Percy Wood of Wyebridge, the marriage to take place in the Baptist Church, Barrie, on Saturday, November 16, 1957, at 2:30 o’clock. At the Odeon, James Stewart as ‘Lucky Lindy’ in the “Spirit of St. Louis”. At the Pen, Lewis and Martin in “Hollywood or Bust”. Obituary – A resident of Penetang for 30 years, Charles Gropp died Oct. 30 at Parry Sound General Hospital. Mr. Gropp had been in ill health for the past two years and had been a patient in the hospital for the past five months. Funeral service was held Nov. 2 at A. Barrie and Sons funeral home. Pallbearers were Boyd Hollister, Herb Scott, Elvard Reynolds, Fred Zoschke, Gordon and Alvin Gropp. Charles Gropp was born in 1885 in Brunner, Perth County. He moved to Penetang when two years old and lived there for 30 years. He had been in the lumber business with his brothers for about 15 years. Later he farmed at Moon River and had lived there for the past 40 years. 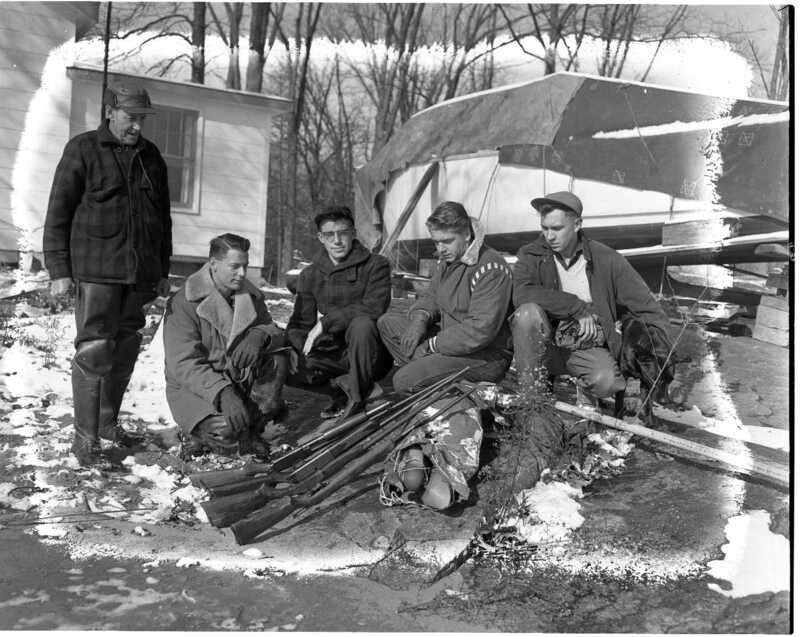 He enjoyed boating, fishing and hunting. He is survived by two brothers, Amel of Toronto and Harry of Penetang; one sister, Dorothea of Penetang; two sons, Carl and Bill; and two daughters, Dorothea and Esther of Moon River. Obituary – Funeral rites for Mrs. H. Lavigne were held in St. Mary’s Church, Kitchener, Nov. 6. Born and raised in Penetang, she was the daughter of the late Gasper and Sopherine Bellehumeur. The solemn requiem funeral mass was celebrated by, her son, Rev. Norbert Lavigne, assisted by Rev. D. Kirwan and Rev. B. Murphy. Rev. W. Lalonde acted as master of ceremonies and Rev. A. Mayer preached the sermon. In the sanctuary were a large number of priests, all members of the Congregation of the Resurrection. Pallbearers were the other six sons of Mrs. Lavigne: Romeo, Anthony, Gerhard, Allan, John and Paul. Surviving is her husband, seven sons and three daughters: Iola Marguerite (Mrs. H. Klug) and Sister Denise Marguerite (Leona) now residing in Midnapore, Alta. who was unable to be present. In attendance at the funeral were many friends from Kitchener, where Mrs. Lavigne had made her home for the past 30 years. Represented also were the Catholic Women’s League and the Christian Mother’s Society, in both of which Mrs. Lavigne had been an active member. Ten Years Ago This Week 1947 – Department of Highways officials were studying a proposal for building a new superhighway which would cut through from Waverley to Waubaushene, up the easterly shore of Georgian Bay to Parry Sound, and north to Sudbury. * * * Coldwater was to be the headquarters for a new 90,000-acre Simcoe-Muskoka forestry project. Major G. R. Lane was named to head the project. * * * Mayor Charles Vent had announced that he was retiring from civic politics. 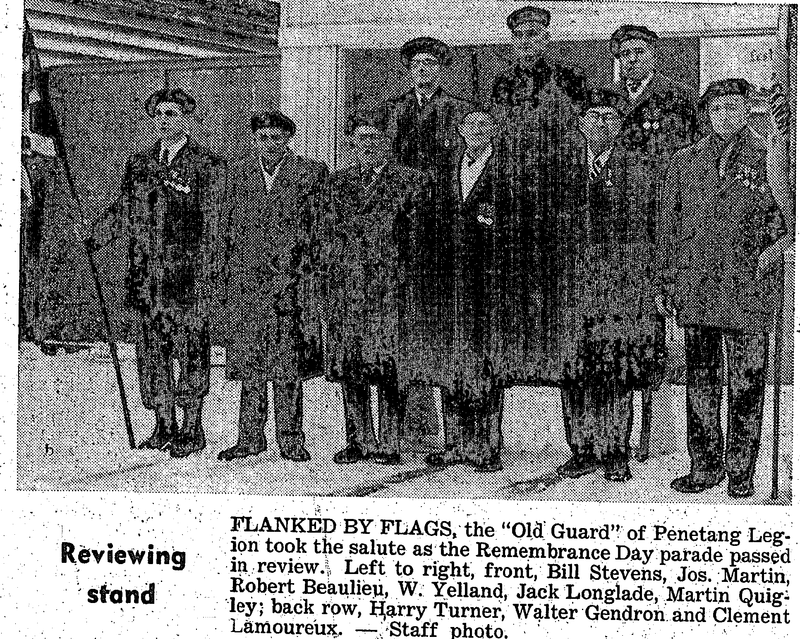 Reeve Herb Taylor and Deputy-reeve Charles Parker were mentioned as possible candidates for the mayoralty. * * * Petitions requesting money bylaws amounting to $135,000 be placed before the electorate for approval at the December elections, had been presented to Penetang council. Of the total, $75,000 was to be used for the construction of a proposed 12-bed wing to the hospital and $60,000 for a community centre and arena. * * * North Simcoe municipalities had been informed that effective Jan. 1, 1948, Midland High School would become an area high school, serving Midland, Victoria Harbour, Tay Township and part of Medonte Township. 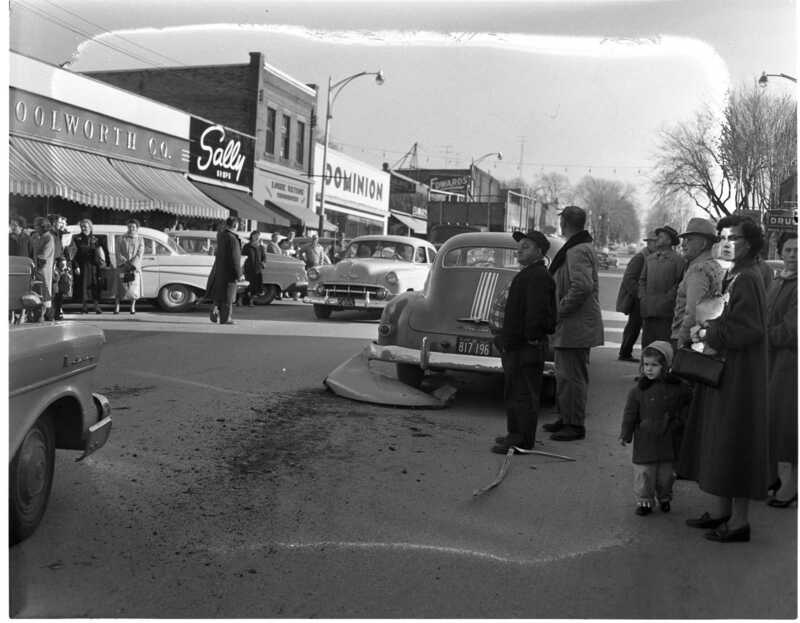 * * * A petition, signed by 573 public school supporters, requested Midland Board of Education to establish kindergarten training classes in each of the town’s three public schools, commencing with the fall term in 1948. Now that the Russians have two satellites orbiting the earth, we have been wondering how many calamitous events will happen which an old aunt of ours used to say wouldn’t happen until there were “two red moons in the sky”. B. STRICKLAND Realestate Ad – $1,000 down, $35 monthly, a real bargain: 3 bedrooms, insul-brick, insulated, with big garage. East. * * * $3,000 down and $50 monthly: a really big brick home; 5 rooms plus modern 4-pc. bath upstairs, 4 rooms incl. 25′ living room down, rads. East. * * * That $700 bargain on Olive St. has been snapped up, but we have 37 other homes for you to choose from! * * * $7,500 full price (easy terms): Queen St.; brick, 7 rooms, insulated, 3-wire SVC, garage. * * * Pictures and complete descriptions of these houses and many more may be seen 24 hours-a-day, 7 days-a-week, in our glass display cases at the old Capitol Theatre, King St. – STRICKLAND in Penetang, $500 down, and $35 monthly (Or what do you offer ?) gives immediate possession, 3 bedrooms; big living room, tub and WC, well wired, Robert St. * * * $1,000 down, $45 monthly: ,2 bedrooms, hardwood, heavy wiring, 3-pc. bath, Alexandra Cres. * * * $1,000 down, $70 monthly: 8 room house on Wolfe St.; buy now—rent out 3 or 4 rooms and let it pay for itself! Another enjoyable trip to the past – thank you for doing this. 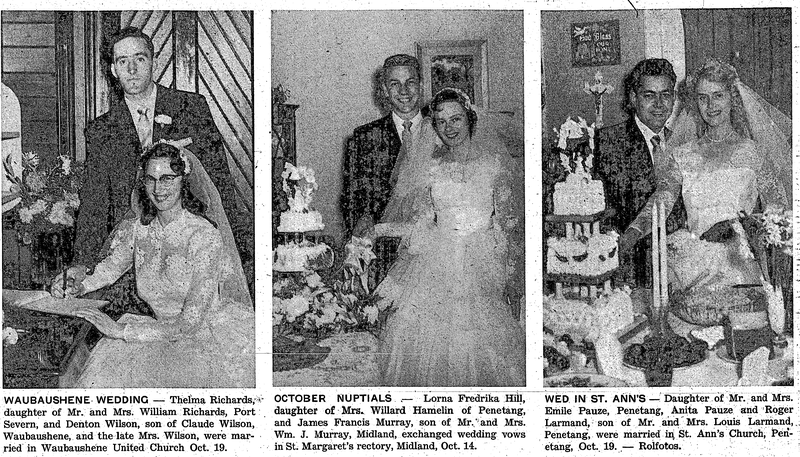 One note of interest – the trio of wedding pictures / notices presented – my mom & dad went to the 60th anniversary open house of Mr and Mrs Lorna (Hill) & James Murray several weeks ago! Thanks for your comment Deborah. It’s great to see the connections.